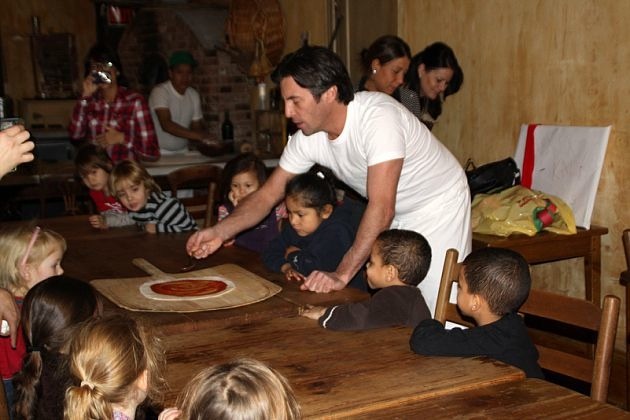 Lucali’s throngs of rabid fans can breath a sigh of relief: Carroll Gardens’ star pizza chef Mark Iacono tells South Brooklyn Post he is returning to New York on Friday to reopen his beloved Henry Street restaurant. Iacono had closed the Brooklyn pizzeria weeks ago to concentrate on opening his South Beach, Miami restaurant and bar. Fans come from far and wide to wait for a table at Lucali (which does not take reservations), and folks were nervous after Iacono closed for a few weeks in October for renovations to his self-designed flame-hot oven, and then again in January to open his Miami restaurant. But all is well and everything should go back to normal on Friday, Iacono said. The Miami pies are good, Iacono says. The chef, a Carroll Gardens native and former marble mason, who designed Lucali on Henry Street down to each lovely, romantic detail, as well as the Miami restaurant, says he loves Miami, but misses Brooklyn and can’t wait to come see everyone. He’s probably going to look pretty tanned — says he even got a little sun poisoning while hanging out on the beach. Open Wednesday to Sunday from 6 p.m.
No reservations, BYOB, serving only pizza and calzone. Arrive early to get on the list for a table. They’ll call you when it’s ready.